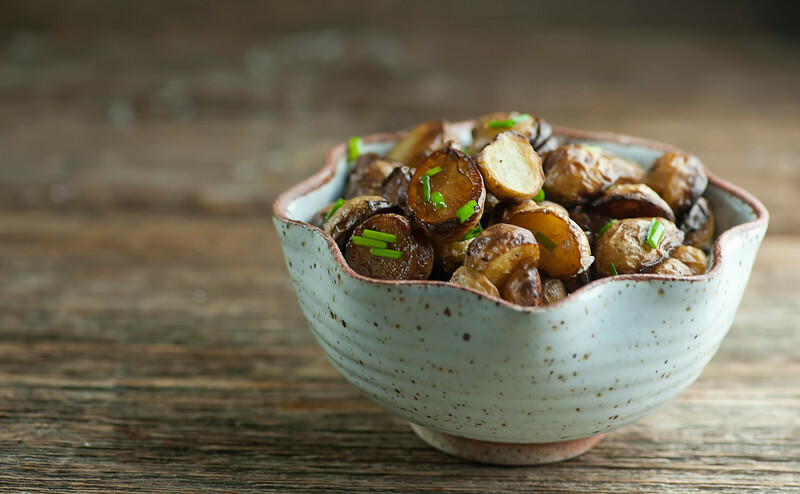 If you love salt and vinegar potato chips as much as I do, which is a ridiculous amount of love, you are going to be head over heels for this recipe for vinegar salt baby potatoes. 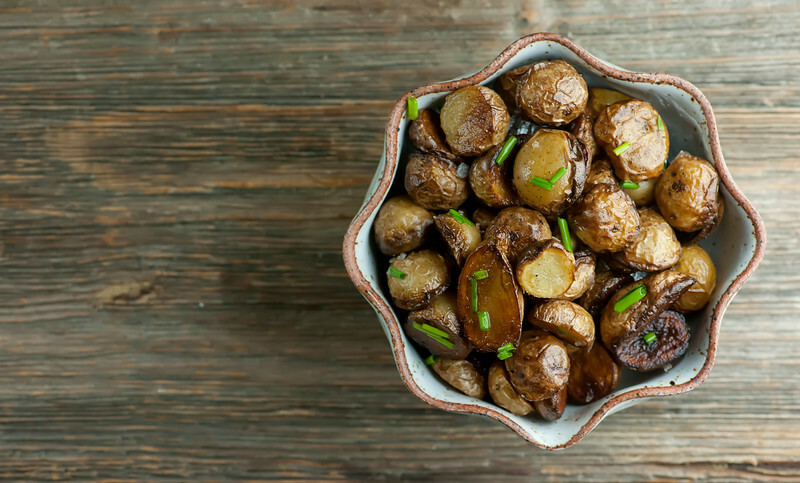 It basically takes those three things we adore – potatoes, vinegar and sea salt – and cooks them up into a side dish that we can proudly eat alongside whatever you are having for dinner. Personally, I recommend a simple, classic grilled steak (and click here for my beloved method for how to grill a perfect steak every time), but whatever is on your grill is going to make friends just fine with these sassy little potatoes. Grab some vinegar and salt and let’s make them! …adorable little baby potatoes. Both the red and yellow ones work perfectly fine, and make sure you go for the Yukon variety if you can find them. And can I get an Amen for a potato recipe that involves exactly zero peeling of the potatoes? YES. The first step is to simmer these babies until they are just tender. They are going to finish up in a skillet so they get a little bit of crispiness on the outside, but the main part of the potato-cooking is going to happen in a pot of simmering salted water and white vinegar. You’ll want to cut them in halves and quarters first, both to make them perfectly bite-sized, and also so we get some nice potato surface when we saute them up. When they are nice and tender, which takes about 20 minutes or so, melt some butter in a large skillet and pour in the potatoes, along with a little more salt and a nice generous grinding of black pepper. Stir them around gently every few minutes or so until your potatoes are the perfect shade of deep golden deliciousness. You don’t want to stir them TOO much, because you want a nice little crust to form on the surfaces of the potatoes, but you do want to make sure every surface gets its fair turn. Once they are done, serve them up scattered with a handful of fresh chopped chives for a little extra zing. Even with a perfect grilled steak on the plate, you may just forget about the main course because the side dish is So Dang Good. Cut the potatoes in halves or quarters, depending on how big they are. Put the potatoes in a large pot and add vinegar. Fill the pot with enough water to cover the potatoes by an inch or so, and stir in the salt. Bring to a simmer and cook until the potatoes are tender, about 20 minutes. A knife should slide into the potato easily, but you don’t want them to be mushy. Put butter and olive oil in a large deep skillet and turn heat to medium high. Add potatoes and another pinch of salt and a grinding of pepper. Cook, stirring every few minutes or so, until potatoes are a deep brown. Serve with chopped chives scattered on top. This looks incredibly tasty! Thanks for the share! Yes, perfect with a grilled steak Kate!! 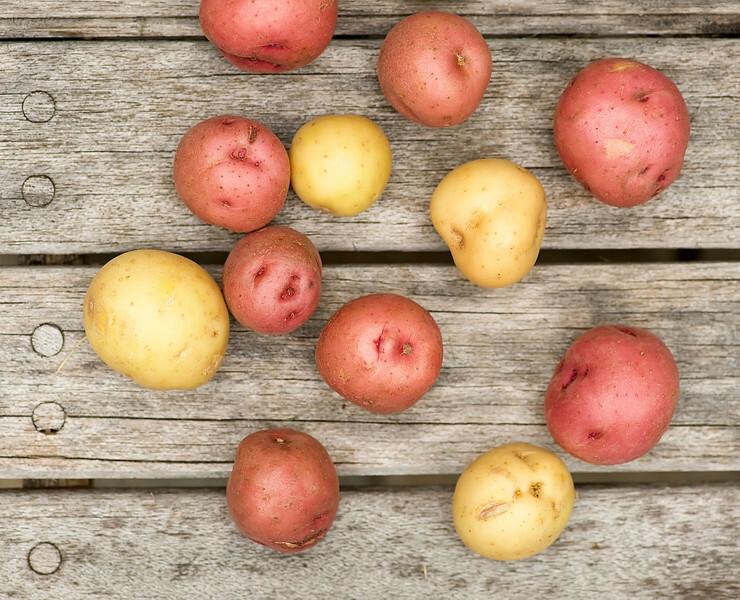 I’m always looking for some new ways to serve potatoes for summer grilling season! Thanks for sharing this one! My boss is a salt and vinegar chips addict and I just printed this for her because she will LOVE it. And heck, so will I. That flavor combo is irresistible! Salt and vinegar potato chips are a favorite of mine, so I know I would love these potatoes! Fantastic recipe!